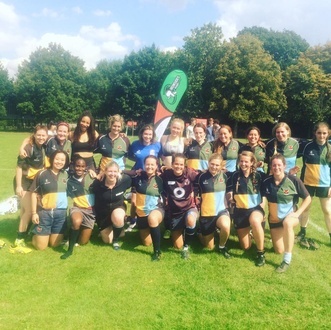 We began at midday with the opening match of Battersea Ironsiders fun day being a friendly against the Gladies, Hackney's first game with Steve Wagstaff as coach. The first half was a back and forth affair with the ball being spread along both back lines and numerous line breaks. The Hackney ladies recovered from the shock of discovering one of the opposition had the speed to catch Niketa to desperately defend their line and hold the ball up three times to keep the game scoreless at half time. The stalemate was finally broken by the Gladies and despite Battersea responding with a try of their own, the game finished 5-7 to Hackney. A very encouraging performance indeed with a lot of impressive debutants especially Rachael Lipman in the centre, with our Canadian half back pairing Alex Snider and Justine Despins gluing it all together. It was then an hour and twenty minutes till the next game, which was ideal as the longest leg of the journey lay ahead from South of the river to the fantastically non-specifically named "East London" Rugby Club. Timing was perfect as a small (14 men) but perfectly formed Hackney squad kicked off on my arrival. Against an outfit who would be a good test for 15 players, the first half was a struggle despite spirited defending, ending 28-0 to the home side. Our main foray into EL territory was inspired by a typical bulldozing run by Reece Denne, an optimistic sort, Reece clearly overestimated the ground he'd gained on the carry and while on the floor spotted a white line which he thought was the tryline. Alas it was actually the 5 meter line and grounding the ball over it only made it easier for the opposition to turnover and clear their lines. The numerical advantage conceded wasn't helped when Ben Veyrac needed stitches for a deep cut and Jack Green discovered the cheapest way to erase the last few hours from your memory is to tackle someone with your face (I'm sure some of our readership will know other more expensive ways to erase memory). Coach had clearly seen enough and went to grab a spare shirt to make a playing comeback. This inspired the team to a much better second half were Jim Miller's sniping runs set up two tries to bring the score back to 40-10. Over at Woodford RFC, our 1st XV were making their second messed-up-public-transport-inspired slow start this season. But a strong second half (no doubt encouraged by the return of Glenn Prowse's magnificent beard) saw them run out 7-19 victors (More details can be found in the match report). Our second win over London 2 opposition in two weeks sets us up ideally for next weeks debut at that level. After the game, with real man of the match Ludo Bathgate absent, Matt "6.5 out of 10" Strong justified PJ's dubious decision to name him as second choice by winning the pint down off.